The thrill of a fresh start! 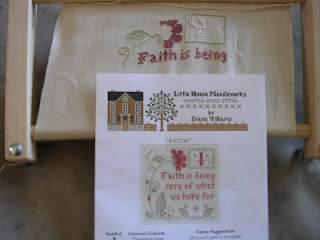 Yesterday my husband had off work, so we drove out to our local Ikea store for lunch and some shopping and then found this really cool needlework store that was way on the other side of town from us. I guess I should be glad there's not a really cool store right down the street from our house cause then I would be broke (or having to work there in exchange for cross stitch charts!) Anyways I hadn't been there before and there is nothing as exciting for me as getting to see all the beautiful designs actually stitched in person. The one above was a shop model and the pinks and greens were beautiful. The picture on the chart doesn't do it justice. So I started this one at work last night instead of working on "Special Delivery". Another cool thing about this one is it came as a semi-kit with all the threads needed included, so I was happy about that. Plus this new store carries Crescent colors threads, before I was having to find replacements out of Weeks or Gentle Art threads. So all in all I am very excited to have a new cross stitch shop to visit here in town, I love just going to look at all the beautiful pieces on display. If you live in Phoenix the shop is called Attic needleworks, and the other one I frequent is Needler's Nest. If you know of any other good shops let me know. So I worked on finishing my July snippet all morning, only to have it end in disaster. Well not total disaster, but a lot of work only to have it come out wrong. If you notice in the pic the top block looks crooked compared to the bottom, that's because theres one to many squares on top, so the whole top will have to be ripped off and re-sewn. But not today, this little mess killed my motivation to continue. So instead I have painted my nails, and caught up on everyone else's cute cross stitch blogs. At least I have a whole month ahead of me to finish this piece. I am almost done with the "July" Lizzie Kate snippet. I liked how the June one turned out so much, I couldn't wait to do this one. I will probably have it done by tommorow. I have only been working on it two days so far. I found fabric to finish it with today, I just want to find some star beads to do the outer edge with now. I have been working on "Special Delivery" too. I would guess it is about 40% done. I will try and post another picture of it with my next post. It's still not as fun to work on as the Lizzie Kates, especially with an August deadline looming over my head. I finished my Lizzie Kate snippet!! It turned out so cute I think. I found the perfect bee fabric in a quilting store, actually bought 3 different colors of the same print. I cut out circles from the yellow fabric and fused/stitched them on top of the green fabric. And my bee charms off of ebay arrived today. 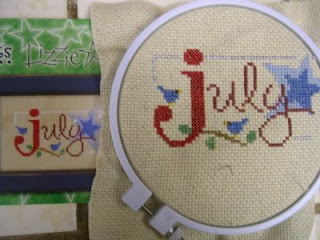 I also changed the french knots I had for the flower centers into just a backstitch, the knots looked too messy. The only part I'm not happy about is the bottom where I had to hand stitch it to close it off. I have yet to figure out the invisible stitch (where the stitch is hidden inside the seam) so it looks sloppy to me because the thread shows on the outside. This will probably wind up as a wall hanging above my calender. I'm thinking of doing the July snippet and finishing it the same way. Except instead of bees, I would do a striped background with blue stars in the circles. Yeah! I finished my Lizzie Kate June snippet. 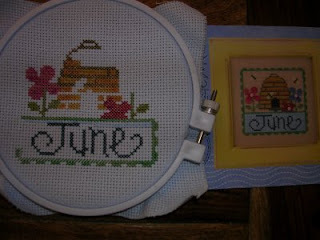 I ordered little bee charms yesterday off of ebay, so I am waiting for those to arrive to sew it into a little ornament. Instead of the buttons that came with the chart I did french knots for the flowers center, I figured buttons and charms might be too much. So I did work on "Special Delivery" a little bit more last night (a very little bit)! But then of course went right back to my snippet. I am almost done with it, so exciting! 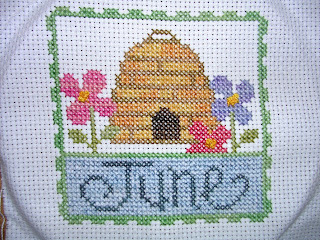 I don't like how the blue looks behind the word June though, so I am sending my other 1/2 to the cross stitch store tommorow to pick out a new shade of blue. Its right next to his work, and I would go myself but its a 45 minute drive each way. So I only go when I am hunting for new projects, all other times I send him with a list of what threads to buy. The ladies there actually know he's there for me its too funny. 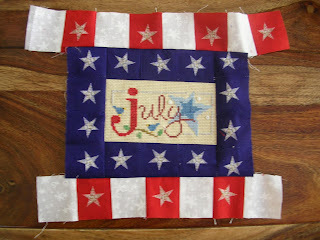 You can kind of see the blue thread I was supposed to use in the upper right corner of June , it barely shows up. The piece was supposed to be stitched on tan fabric, but all I had in my fabric stash was blue and I was a little too eager to start this piece so I went with what I had. I thought about maybe doing a grass green instead of the blue behind June, but the piece already has a lot of green in it. Anyway can't wait to have it done and finished. I am going to the quilt store tommorow to look for some cute bee fabric to finish it with. I got a little bit more of the Lizzie Kate "June" snippet done last night at work. I haven't even looked at "Special Delivery" though. 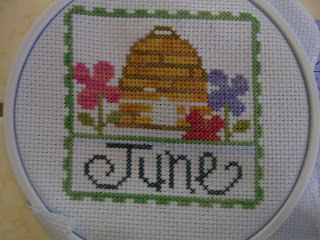 I'm thinking instead of stitching the bees on this one I am going to try and find some bee buttons or charms to attach. I am going to make this into a little ornament pillow thing, and finish it with either sunflower or bee fabric. Nice and summery. Tonight is a ten hour night at work so hopefully I will have some down time to work on "Special Delivery". I worry I am going to keep putting it off until right before the baby is born and then be stuck stitching 24/7 (which is never fun when you HAVE to do it). This is another "will be done" on my list that i'm hoping will actually be done by June. I love Lizzie Kate stuff, the bright colors make it so much more fun to do. I also worked a little more on "Special Delivery", mostly on the leaves. The green is a nice change of pace from all that white. I mostly just want to get it done so I can go back to working on my own stuff. This is my latest work in progress, I have already completed it once for my own daughter and now am doing it again for a friend. I forgot how many different shades of white there are in it!!! But i Y the little babes tiny feet and toes.